Healthy eating – what do you mean? Flourless – yes or no? When I heard recently that wheat flour is number 1 killer in our lives, I stopped in my tracks and asked: ‘Oh really? What on earth’s wrong with flour? Why is good, honest wholemeal bread bad for you?’ The person in question couldn’t give the answer, but they continued following this new ‘fad’ anyway. Then I saw quite a few cakes on the internet that claimed to be made ‘without flour’, and was intrigued to know what they replace it with if flour is such a no-no. I have discovered that these flourless desserts use cornstarch, a bulk of chocolate or cocoa powder and definitely more powdered sugar than I would use in a similar flour-based variation. I don’t know much about cornstarch, but both chocolate and cocoa powder are heavier than flour, so you will end up needing more eggs or baking powder if you want to keep your cake fluffy. Does that sound healthier? Not to me, I’m afraid. Slovak ‘flourless’ recipes use ground poppy seeds, nuts (almost exclusively walnuts, which are native to Slovakia) or breadcrumbs (is it not baked bread, after all? ), but they fail to achieve the fluffiness of the flour-based cakes, and indeed they don’t seem to be catching on. Is it because Slovak flour (and bread) is so good? Or does the cost of the substitutes play a role? I understand that those with a celiac disease have to replace wheat flour with gluten-free alternatives. Still it’s amazing how many people join in every single diet craze, despite not having any particular health problems or food allergies. Personally, I don’t know anybody with an allergy to eggs, although I’ve met a few people who didn’t like them – at least in their pure form. 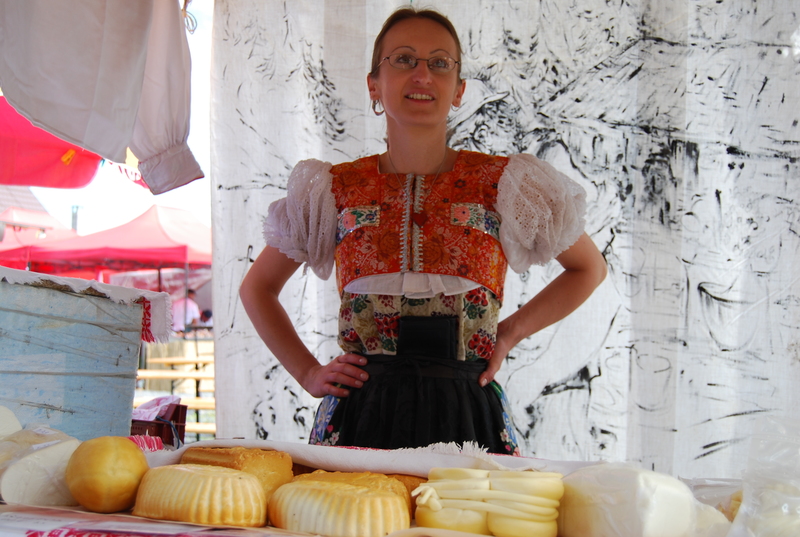 However, no Slovak housewife questions the importance of eggs in our pastries and doughs, even though we don’t use as many as we did before ‘the great cholesterol diet’ ensued. I remember a tram from the 1980s Bratislava – the capital of Slovakia – bearing a large advert along its roof that read: AN EGG A DAY . The general belief at that time was that proteins, especially animal ones, were good for you, and so we were encouraged to eat them on a daily basis. At least until 1989, when the Iron Curtain was taken down and new ideas began pouring in about western eating habits and lifestyle. We in Slovakia were introduced to a vegetarian diet and had learnt that, among other nutrients, eggs were also packed with cholesterol – the sly enemy that attacked our arteries and made us more prone to a heart-attack. It seems though that nutrition scientists are changing their minds about cholesterol and, with evidence based on the latest studies, they are backing away from the conclusions made a few decades ago. Eggs, among other culprits, have been cleared and reintegrated into our diets, to a great joy of Slovak cuisine, which heavily relies on eggs. Another childhood memory well-rooted in my mind is of the ‘morning dairy snacks’ served in school canteens all over the country. They would comprise a half-litre bag of milk with a straw attached to it for drinking, and a bread roll that was occasionally replaced by a brioche or a jam turnover, all for a mere 1 koruna a day. I don’t remember a family who wouldn’t take advantage of this generous offer subsidized by our socialistic government. It was part of the state’s effort to provide us with quality proteins, and vitamins as well. At least we got them in their natural form, unlike these days when lots of children have to take them in pills. Why there were no reports of milk allergies back then, I don’t know. The fact is we loved our twenty-minute ‘dairy’ break that would come at about 10 o’clock. Who wouldn’t? It meant chatting and hanging out with friends, as well as having our bellies filled and happy until lunchtime. I think our parents loved it even more, as they didn’t have to bother about our diet. We were fed a hot meal at the school canteen at lunchtime, and would only have a family meal in the afternoon when everyone was back at home. There was no question about it until I was 15 or 17 perhaps? Bread and butter was a routine breakfast in my family, along with a cup of hot cocoa drink or lemon tea. Then a fashion of hydrogenated fats arrived and with it another slogan that went like “HERA – vlastná sestra masla” or ‘HERA – a proper sister of butter’. A decade later a new line of fats came from behind the Iron Curtain, and I remember buying a tub of margarine with a glitzy cover and a magically sounding German name for three times the price of Slovak butter. We had to try what we’d been deprived of for so long, didn’t we? Yes, we all seemed to go crazy with this ‘plant-based’ butter, as it was called at the time. Not only did it come in variety of containers, colours and names, but it was claimed to be healthier than traditional butter or pork lard – the two basic fats Slovaks used to spread on their bread slice before. Where do nutritionists stand on ‘healthy eating’ today? Well, they’ve decided (or discovered) recently that it’s not fat that makes us fat and sick. Instead, sugar is said to be the problem, or better still, our ‘high-carb’ diet, as they call it this time. What will they come up with next? Fortunately, I’ve become immune to all this ‘healthy eating’ craze over years, and have learnt to follow my body’s advice rather than latest nutritional trends. I’ve never been a big meat eater (except in my puberty and three pregnancies), but will probably never give up bread, legumes, fruit and good, home-made desserts. I like vegetables, but only pick those my body is happy with. Quality of food is more important for me than its amount, and so are the people I share it with. I do believe that you can eat what you like, as long as it is in moderation, and balanced with an active lifestyle.